Nobody sticks their nose in our business! Our business was established in 2005, however this industry has run in our family for decades; passed down from generation to generation since 1958. 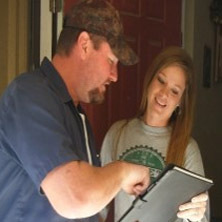 See what our previous customers have to say about B&B Pumping services. Do you have questions about the services we offer? 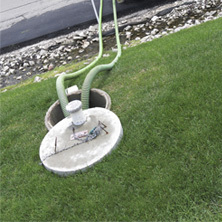 Would you like to get a quote for pumping services? If so, contact us here. We are waiting to hear from you. Welcome to B & B Pumping! We appreciate your interest in our services. Proudly serving Fort Worth, Decatur, Azle, Haslet, and the surrounding communities, we are dedicated to providing quality, septic tank services at an affordable price. With a dirty job like this, you need to hire a company you can trust, one that is devoted to doing great work. Our technicians will always show up on time with a great attitude, and they will always pay close attention to your needs. 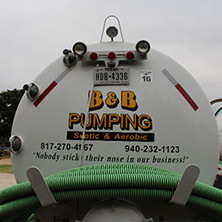 Specializing in pumping and cleaning aerobic and conventional systems, B & B Pumping is the name you can trust. For more information or to schedule an appointment, give us a call today at 817-270-4167.